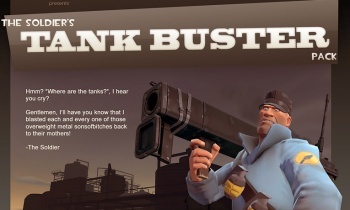 Hot on the heels of the TF2 Engineer update comes a new slew of items - only these babies weren't designed by Valve. Valve is good at many, many things - but if you had to pick one single thing that the PC developer was best at, it would probably be "taking good ideas from its community." Counter-Strike became a game in its own right, Portal was originally developed by students, and many of the maps and items currently in Team Fortress 2 were designed by the players. Well, with the long-awaited Engineer Update finally over and done with, the next bout of unlocks will be yet another community-inspired batch. It's kind of community-inspired, anyway - it's the result of a contest held by Valve and "videogame art resource & community" site Polycount. Artists were encouraged to come up with a "set" of items for one of the game's nine character classes, and five winners would have their sets added to the game. As to be expected, the winning entries were all pretty impressive. The Soldier gets a heavy-duty "Tank Buster" rocket launcher and radio pack (exactly what use the radio will have remains to be seen). The speedy little Scout gets a 50's-milkman-themed outfit with the "Short Stop," a pistol that fires four rounds at once. While the Pyro's "Gas Station Attendant" set seems mostly cosmetic - as does the Spy's "Saharan Spy" Egyptian film noir getup - the Sniper seems to be getting a tranquilizer gun called the "Sydney Sleeper." All in all, there's some very nifty stuff coming from Polycount and Valve. Even the unassuming Pyro and Spy packs won't just be cosmetic: In a post on the TF2 blog, it was announced that the team would be working to "attach gameplay attributes (probably of a game destroying nature) to these items." So feel free to wildly speculate about what they'll all do for now. In the meantime, I'm going to be alternating between drooling over that gorgeous new Spy knife and trying to unlock that damned Wrangler on the Engineer.